Height: 16cm by 19cm wide. The inspiration for this stylish mantle clock comes from the Italian pioneer of radio, Guglielmo Marconi. Marconi's work in the development of wireless radio was quite literally a quantum leap in the field of human communication, contributing greatly to the advancement of the modern world. The design of the Marconi '1' shows the first experimental radio waves being transmitted across the Atlantic in 1901. The three angled lines in the middle of the clock symbolise radio signals radiating outwards from the 'V' shape transmitter into the ether. By the 1920's wireless radio was regularly being broadcast into millions of homes and providing entertainment in a completely new way. 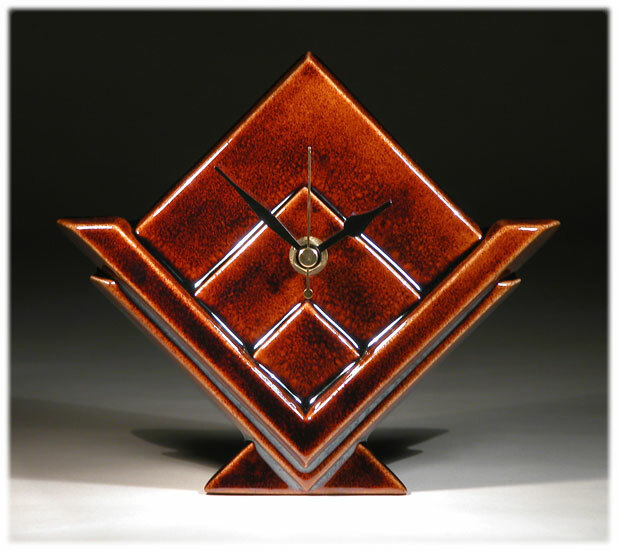 This piece has been finished in Echo Of Deco's own Mahogany Flame glaze, but is also available in many of the studio's other unique glaze colours.